Planbox, the pioneering provider of cloud-based Agile Work Innovation solutions, today announced the availability of the first innovation management solution to integrate with Facebook private groups. The platform allows organizations to build on the ideas and discussions that start in Facebook. Facebook private group posts and comments are collected and mapped into Planbox Innovate’s workflow-driven idea management system where the ideas can be further discussed, reviewed, evaluated, and developed by the same Facebook private group user community and your team members as well as other subject matter experts. “Planbox’s willingness to take on and successfully complete this integration reflects their dedication not only to their clients, but also to their own mission of fostering innovation. The integration with Facebook groups bridges the gap between convenience and creativity – we are able to effectively extend our ‘Idea Bank’ beyond the confines of a single platform, allowing employees to begin the innovation process on a platform familiar to all: Facebook. We have seen tremendous growth in employee engagement with the utilization of social media and look forward to using it in conjunction with Planbox’s innovation management tools.” stated Rick Yockelson, SVP, People and Administration, Hudson Group. Planbox private group Facebook integration is powered by Planbox Innovate’s powerful backend cloud synchronization technology. 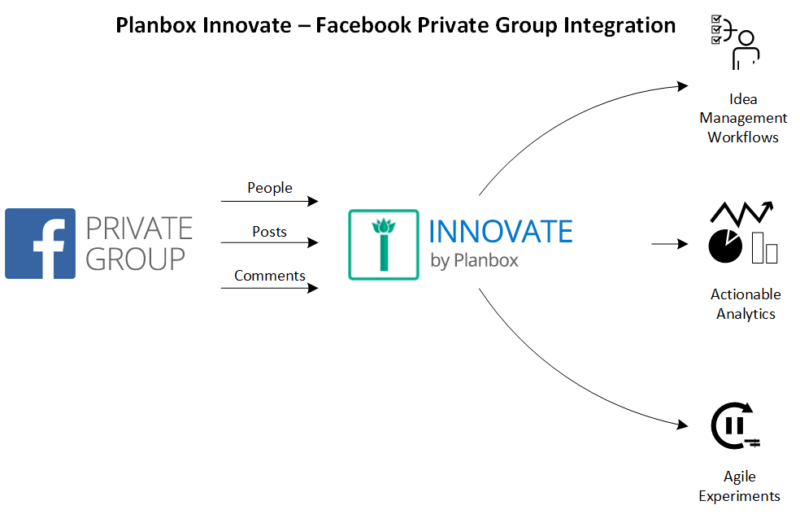 By integrating Facebook private groups with Planbox, companies can extend the innovation process into their secured social media platforms. Planbox is the pioneering provider of cloud-based Agile Work Innovation solutions – from creative ideas to winning projects. Our mission is to help organizations thrive by transforming the culture of agile work, continuous innovation and creativity across the entire organization. Our family of products include Collaborative Innovation Management, Team Decision Making, and Work Management applications. Planbox is designed to be the agile work innovation tool for everyone, built for companies and teams of all sizes and trusted by some of the world’s most recognized brands including Verizon, CGI, Sempra Energy, Starbucks, Stanford, Philips, and The Salvation Army with millions of internal and external users. To learn more, visit: www.planbox.com and unleash your innovation butterfly.